[OCT. 30, 2002] "Your Child: Bully or Victim?" Peter Sheras, Ph.D. with Sherill Tippins, Skylight Press, 2002, 224 pages. How should parents react when they learn that their child is a victim or perpetrator of bullying? In their new book "Your Child: Bully or Victim?" 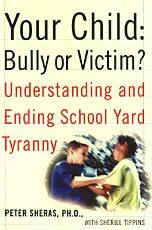 authors Peter Sheras and Sherill Tippins help parents learn how to understand and end schoolyard tyranny. In the opening chapter, "The Roots of Aggression," they write that bullying "is not a question of ‘bad kids verses good kids,’ but a situation in which both children need help in learning how to channel their emotions and successfully interact with others." They also discount the belief that children, when left to themselves, act in aggressive and bullying ways. In "‘Kids Will Be Kids’ and Other Myths about Bullying," Sheras and Tippins test your bully IQ and set the record straight on some popular misconceptions about bullies (it is untrue that some people are born bullies and nothing can be done about it). They also refute several myths about how bullying works (such as, it’s just a phase; they’ll grow out of it) and who becomes a bully (boys and girls can become bullies). "Bullying: Who, What, Where, When" describes the different forms of abuse bullying can take (physical, verbal, social and sexual) and differentiates between who can become a bully or a victim. In the chapters "Is My Child a Victim?" and "Is My Child a Bully?" parents are alerted to the warning signs that something is wrong when their child becomes a target or aggressor. One way to recognize that a child is becoming a bully is to identify the characteristics that bullies exhibit. Unfortunately there are other factors that can drive a child towards bullying; these factors have less to do with the child and more with parental influence. These influences include a lack of involvement by the caregiver, permissive attitudes toward abusive behavior, excessive punishment or outbursts when disciplining children, and using a parenting style incompatible with the child’s natural temperament. "When Your Child is a Bystander" counsels parents on talking with children about bullying, why it’s important to act when being bullied, and how to stop bullying at school, in the neighborhood or in the child’s world. "Empowering Your Child" gives parents the tools necessary to work with their child to help them determine whether they have been a victim of bullying. The parent should ascertain exactly what happened, how the child can handle the situation, the child’s response, determine if the response worked and decide when the parent should intercede in the matter. If you believe your child may be the aggressor, you should help the child explore their feelings, discover what makes them angry, learn how their behavior affects other children and decide what to do when they get angry. In "Teamwork: Talking with Bullies and Their Parents" the authors help parents identify the problem within a child bully, how to talk to the bully, solving the problem together as a family and what to do when talking doesn’t work. The book’s final chapters discuss how schools can intervene and help parents solve a bullying or victim problem, when it’s time to seek help from the community (such as the police) or a professional (therapy, counseling, etc. ), and how parents can address the problem themselves (through self awareness, empathy, communication and flexibility). "Your Child: Bully Or Victim" is an essential source of information for every parent. The book has a wealth of resource materials and contains a suggested reading list for parents and children, several websites devoted to bullying issues, and support organizations and hotlines. Adele Faber, co-author of the book "How To Talk So Kids Will Listen & Listen So Kids Will Talk," writes that Sheras and Tippins’ book is "A rich resource for parents and educators determined to end bullying behavior … Filled with fresh insights and practical suggestions for civilizing the bully and empowering the victim." This book is recommended for all parents, especially those who are concerned about their child becoming a bully or a victim of bullying. [OCT. 22, 2002] The 2002 annual meeting of the board of directors of Lincoln Community Theatre resulted in the re-election of three board members and the addition of two new directors, Tom McLaughlin and Margo Schwab, both of Lincoln. Returning to serve another three-year term are Teri Fink, Louella Moreland and Roger Boss, all of Lincoln. Officers elected for next year are Teri Fink, president; Jean Gossett, vice president; Roger Boss, secretary; and Rich Reinwald, treasurer.